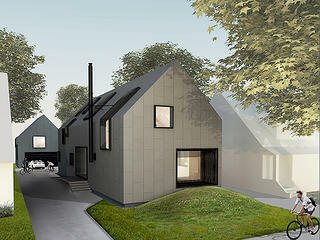 Donnelly Eber Architects and Simcon Homes, the winners of the Shaker Design Competition, wanted their infill design to fit in with the existing aesthetics of the neighborhood. Donnelly Eber's designs include solar water heating, solar electricity, radiant floor heating, and wood-burning stoves. When Shaker Heights, Ohio, was founded by railroad moguls the Van Sweringen brothers in the early 1900s, they envisioned the planned community as a haven from the chaos and industry of the city of Cleveland. By the late 2000s, however, the formerly idyllic streetcar suburb found itself badly rocked by the economic recession and subprime mortgage crisis. Homeowners vacated and abandoned their foreclosed homes in record numbers, leaving houses open to vandalism and break-ins by opportunists looking for copper wire and anything else with resale value. By 2016, despite the city’s best efforts to fight vacancy and prevent already-vacant homes from becoming blighted, Shaker Heights had used federal, state and county grants to clear 50-plus lots at a cost of $10,000 to $15,000 apiece. As a way to combat disinvestment and encourage infill that complements the city’s historic character, Shaker Heights conceived the Shaker Design Competition in 2016. The idea was to get top-tier architecture firms to partner with local construction companies on designs for infill homes that wouldn’t look out-of-place in their historic surroundings, but would also respond to long-term energy efficiency and accessibility trends. Ideally, the houses will last for the next 100 years. “We’ve never really had the opportunity to think about new housing. There was no reason to. There was no land to build on,” Lewis says. Much of the housing stock in Shaker Heights dates back 100 years or more, and many of the neighborhoods are characterized by Tudor homes with sloping roofs and timber framing. The competition called for proposals that addressed three vacant lots in the city’s southern Moreland neighborhood, and each of the 12 submissions was ranked by a jury of nationally-known architects. The winners were announced in early February, with Donnelly Eber Architects of New York, in partnership with Simcon Homes of Cleveland, taking home the first-place prize of $5,000 cash. The jury also named two runner-ups, Decent Goodfellow Architects and Moreland Collaborative. According to the city, all three winning designs will inform the final product. Hayley Eber, a principal at Donnelly Eber, says that her firm’s main design goal was to make the new construction fit in with the aesthetics of the existing neighborhood. The contest’s original language had suggested playing around with the density of the lots (i.e. 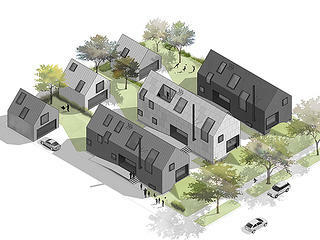 allowing for a duplex or multi-family housing,) but Donnelly Eber’s design focused on three single-family homes with detached garages, characteristic of houses on the surrounding blocks. Another crucial focus of the competition was sustainability, and Donnelly Eber’s designs include solar water heating, solar electricity, radiant floor heating, and wood-burning stoves. The solar aspects are powered by the Tesla Powerwall, a rechargeable home battery pack from the makers of Tesla electric cars. As part of the incentive for the competition, the city of Shaker Heights provided the vacant lots, and Donnelly Eber and Rodney Simon of Simcon Homes are currently in the process of figuring out financing options for their design. As cited in the proposal, the completed homes would sell for between $400,000 and $600,000. Lewis calls the construction of the design competition houses a “community conversation,” and notes that several of the proposed designs will require potential zoning changes and conversations around what kind of density the lots can support. Nevertheless, the design competition is a bold and innovative way to confront the city’s problems of vacancy and disinvestment. Lewis underscores Shaker Heights’ commitment to preserving the character of the streetcar suburb that the Van Sweringen brothers believed in so completely over 100 years ago. 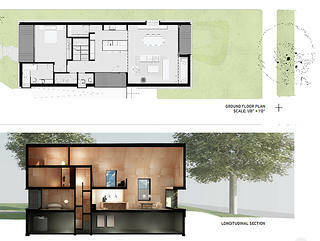 The designs included detached garages, characteristic of the surrounding neighborhood.